The Great Western has been getting ideas again. Earl Cawdor addressed the half-yearly meeting at Paddington last week – and here it is today, his speech, set out in the Cornishman and – if you want that bit more detail - the Cornish Telegraph. This morning, the travelling man with his eye on the second-class fare; the shareholding man who will be in receipt of a 3 ¾% dividend; the man on the footplate with his sights set on a shorter working week; on a pension at the end of his working life: one and all can read his lordship’s words of wisdom. It’d a huge enterprise, all right, the Company: the numbers quite enough to boggle the mind. Hundreds of thousands of pounds – and, from what his Lordship said, it seems that every department is showing an increase. But costs are going up too: wages, because of the revised hours; repairs; the amount swallowed up in opposing upstart companies who want to bring in their own Parliamentary Bills and grab a share of the trade. And in the big cities, where the trams are coming in, the Company’s fares have had to come down. The cost of taking a train a mile down the line is now fully 3/3d. And so, explains his Lordship, the company must move with the times. To be precise, it must venture forth from the permanent way altogether. Five petrol-driven motor cars are to be bought. Each will carry 22 passengers. Not “scorching cars”, not by any means. Cars for sober-minded business people. 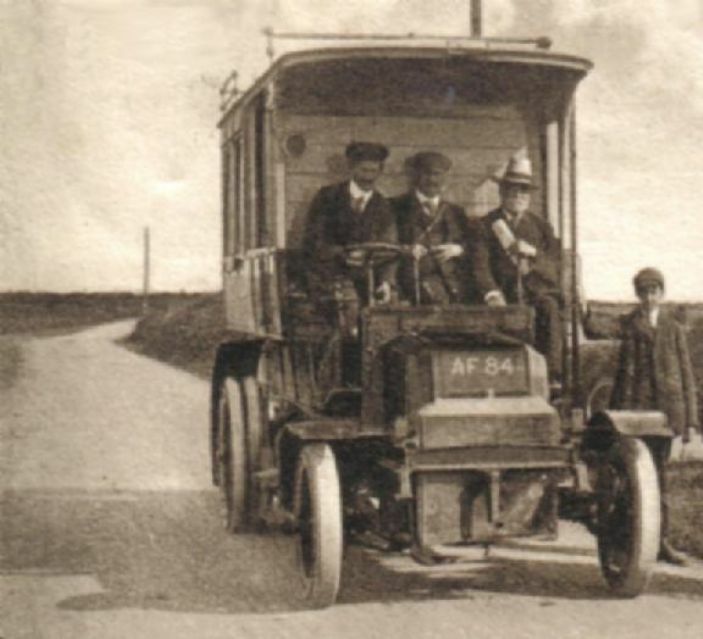 And the first of these cars – the reader learns, perhaps to his alarm – have already been deployed, swaying and grinding their gears on the inclines and bends between Helston and Lizard. Throwing up the dust, and whitening the summer hedges. Alarming the horses. But also “feeding the traffic”, bringing the punters up to the Company’s stations. It’s all being presented as an experiment: “to ascertain what amount of traffic” exists “in the district… whether it would pay to construct a light railway”. The cars can be moved from place to place, just as you please, or rather as the Company pleases. It all sounds very fine – although of course in Penzance, they’ve been hearing about a light railway for ten years or more. A light railway round the dock. A light railway looping round Abbey Basin and along the pier. Nothing’s ever come of it.